One of the questions I love to ask other pros is how they aim. Many of them operate on instinct, and they just hit enough balls to keep their instincts sharp. A few of them prefer to use aiming systems that range from the simple to the scientific. My game already moves at a fairly slow pace, so I don't want an aiming system that is overly complicated, and I find the very simple ones just aren't that effective when I'm not seeing the table well. Over the years I have compiled certain tricks for aiming that I learned from my fellow pros. 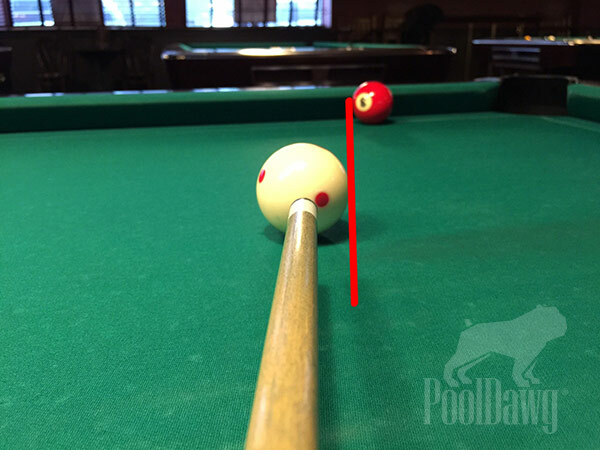 These little tricks are incredibly powerful, especially when the balls don't seem like they want to go in. The first shot is the straight in shot. Shane (as in the legendary Van Boening) likes to divide his shaft up into multiple pieces and use that as a guide for where to hit the object ball. For the next two shots I will use his aiming trick only when he looks down the center of his shaft. 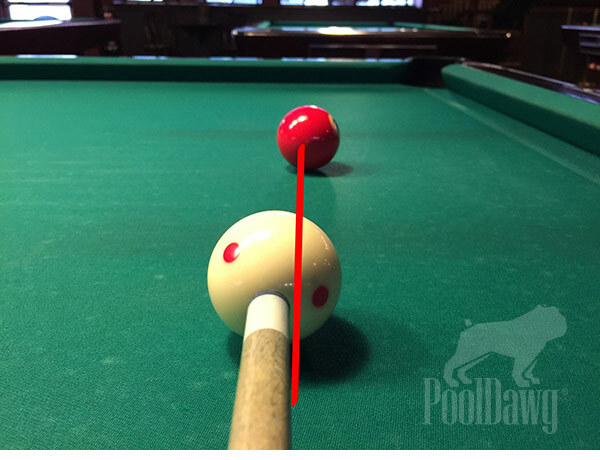 For the straight in shot, Shane draws a line down the center of his shaft and aims that line at the center of the base of the ball, right at the point that it's touching the table. Aiming this way shows a clear connection from your cue to the point of aim. The second shot of Shanes's that I frequently use is when the ball is just off straight. 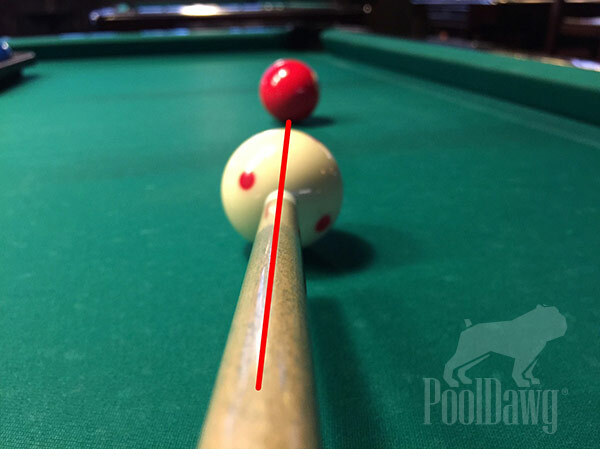 Again a line is drawn down the center of the cue, but now that line points at the left or right edge of the shadow at the base of the ball. If you are cutting to the right, then aim to the left edge of the shadow, and vice versa. This works remarkably well for those shots that only require the slightest of cuts. The next system I learned as a beginner, but then was it was reintroduced to me by pro player Oscar Dominguez. This system works best for shots that are more than just a slight cut. 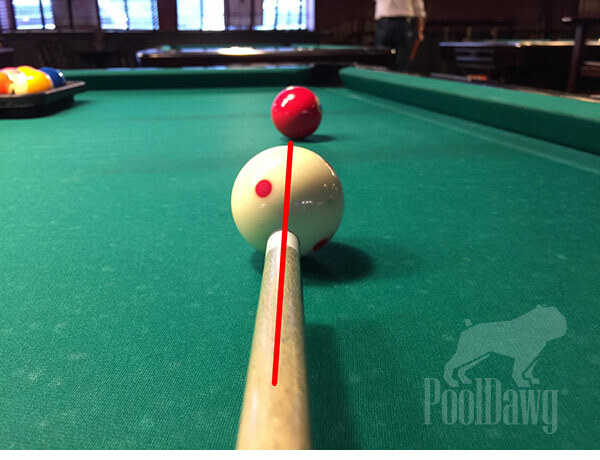 The idea is to point the edge of your shaft at the desired contact point of the object ball. If you're cutting to the right, use the right side of your shaft, and vice versa. The last shot, also shown to me by Oscar, is the thin cut. For shots like these he imagines a line from the edge of the cueball to the edge of the object ball. All of these little tricks are great for aiming most of the shots that come up. They help create the connection between your cue, cueball and object ball, especially when you're not playing well. 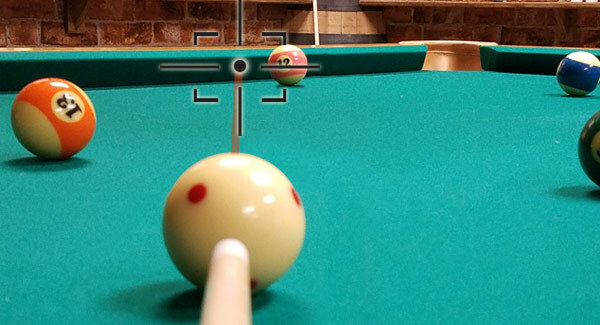 Shooting pool is not unlike shooting a gun, and these systems basically turn your cue into the sight. I hope they are as useful to you as they are to me! Frank Says: "Aiming is one thing but you also need accuracy for it to pay off. Low deflection shafts are engineered to provide the most precise results but you still need to execute. Accuracy will come with practice!"